A couple more garden drawings last night while watching Vicar of Dibley...one of my favourite shows at the moment. These pictures were taken last spring/summer as my weeping rose is nothing but a stitck at the moment...how our garden changes! This is one of my favourite daisies...it looks like any other common daisy, but when it ages, the petals crimp inwards. Also a nice and easy one to strike, so I have a couple in the garden. My hubby tells me he is catching up at work, so he will be able to get back into the sewing room and reno's...yay!! I hope he's not teasing this time...everytime I look out my kitchen window I see a partially built sunny sewing room!!! We have been buying things gradually as we can afford it...tiles for laundry, bathroom and toilet. Paints were picked out ages ago, doors and handles...even the UV blinds have been purchased for the sewing room! But they do say 'All good things come to those who wait'! !...and I have been VERY patient!lol! Love the new drawings! Love that daisy too! I've never seen anything like it! 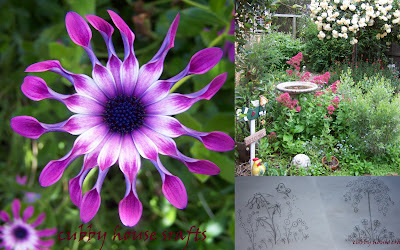 Great drawings...weeping rose & daisy? How exciting, a new sewing room in the plan. I love the Vicar of Dibley also, are you watching reruns or a new series? I am so loving your drawings Lisa. Zoomed into the pics, they look fabulous! What an awesome Daisy! I know the type but have never known the petals to curl inwards like that. I must take your inspiration on board and look around my garden too! Love the new drawings, you should keep them coming and make a whole big quilt out of the blocks you make with them! What an absolutely beautiful bloom, it reminds me a little of the passion fruit flower, which I think is ingenious! Your sewing room sounds like its worth waiting for sweetie - how exciting! I think the flower is an African Daisy, we have a different variety in our garden and they bloom for a long time. It will look very pretty as a stitchery project.